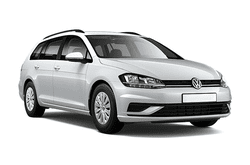 The VW Golf is refined and comfortable, making it a popular option for car rentals in the area and this new variant option is following suit. It has everything you want and need in a luxury car rental and it more than delivers on the quality, comfort, and luxury! It comes with a manual drive, air backs, anti-lock brake system, gets great mileage, is rated for low Co2 emissions, and has several colours that you can choose from. No matter what your reasons are for needing a rental car, the Volkswagen Golf Variant is a great choice that will not disappoint! Make your reservation today and enjoy great mileage, advanced safety features, and comfort that makes any drive a pleasant one.